This beautiful, orange zest makes a perfect addition to any baked dish such as cakes, muffins, and cookies. Add to waffle batter or sprinkle on hot cereal. To rehydrate, let the peel stand in water for about 15-20 minutes. 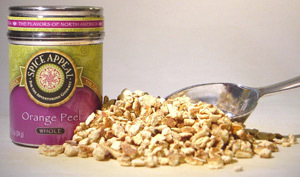 One half-teaspoon dried peel equals one-teaspoon fresh peel.